The small town of Alora is situated 40 km north of Málaga on the road to Antequera and just 12 km south of El Chorro. From a distance, it is a typical pueblo blanco; a whitewashed village nestled between three rocky spurs topped by the ruins of a magnificent castle which has an interesting history. Alora's castle was first built by the Phoenicians and subsequently expanded under Roman rule. In the 5th century the castle was virtually destroyed by the Visigoths, only to be rebuilt under the Moors. Remnants of this era still remain, namely the decorative steel door and the traditional Arab mirador. Between 1587 and 1593 Alora was home to the fabled Cervantes and in 1628 Alora gained independence from Málaga. 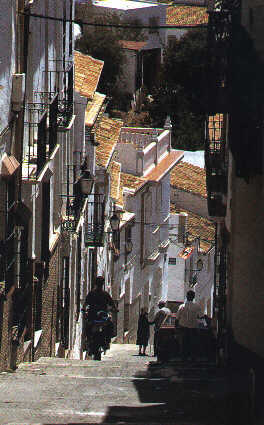 Alora is said to be the birthplace of Malagueño flamenco. A visit to the village, which consists of a series of very steep slopes and attractive cobbled streets, is well worthwhile. The whitewashed streets are lined with lemon trees and converge on a square at the lowest level, overlooked by the impressive seventeenth century church of La Encarnación which was built during the Catholic era of rule on the site of a former mosque. From the square, climb to the castle on foot, or go by car, and visit the cemetery from which you can enjoy the splendid panorama of the Guadalhorce river basin. Amongst the tombs there is a small Gothic chapel. Monday is market day, when the village becomes a lively mass of stallholders and shoppers. Alora's economy is based on agriculture, in particular the cultivation of tropical fruits, olives and grape vines. The cuisine of Alora uses the traditional Mediterranean ingredients of olives, almonds and citrus fruits. There are some delicious local dishes, including sopa porota, based on a garlic broth with croutons, and a revuelta of scrambled eggs with spring onions and vegetables. Castanets are just one of the hand-crafted items that are made in Alora and are one of the most typical instruments used for the traditional dance of the verdiales. Alora's main fiesta is the flamenco festival which is held annually in June. Another popular traditional event is the Romería de la Virgen de las Flores which takes place in the middle of September and is one of the best places to enjoy, first-hand, the traditional verdiales.